Pastels are pure color pigment with a little binder which allows it to take the shape of a bar. Sometimes it is confused with “colored chalk”, but chalk has a different composition. Pastels were born in Italy in the sixteenth century. Literature about pastels indicates that initially only three colors of pastels were produced (red, white and black). Today, it is estimated that more than 1,500 different colors of pastels are offered commercially. No other media allows for the pigment of color to be used in such a direct manner, as when one paints with pastels, and this is why pastel is the most “permanent” media available. Even today, one can see the vibrant colors in pastel paintings that date back to the eighteenth century. When examined at a microscopic level, the trace of pastel on paper is not a flat surface, but an irregular surface with many peaks. This makes light reflect in all directions when it hits the pastel painting, and in turn, this gives pastel painting a special luminosity. With pastels one can accomplish almost any texture, and this makes pastels a very versatile media which does not limit the artist to a specific style or to limited ways of painting. To the contrary, possibilities are as vast as the creativity of the artist. Works in pastel require to be framed under glass to be preserved. There are two types of pastels, dry pastels and oil pastels, but, although it may sound strange, both can be applied in liquid form. There are professional pastel brands in the market that can be applied in dry/oily form over a surface, but worked in liquid form after applying water and/or alcohol to them. This is commonly done to create the first layers of paint (underpainting) or to tone the paper on which one is working to avoid having to paint over the natural paper color. Pastels are also distinguished by their degree of hardness. There are professional brands of hard and soft pastels available. 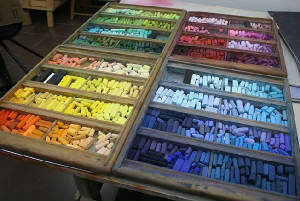 Typically, a soft pastel would be used for the lights of the final layers of a pastel painting, while harder pastels would be used in earlier layers. But there is really nothing written on this, and how pastels are used will depend on the style and preference of each pastel artist. Pastels can be used on paper, but professionally there are many acid free painting surface options designed to maximize the characteristics of pastels. The more abrasive a surface is, the more “tooth” and therefore the more capacity to hold layers of pastel. Which surface to use is a matter of personal preference and style. Many pastel manufacturers offer to the market a varied color palette. Perhaps what is best for the artist is to be able to buy pastels in open stock, and not by sets, in those cases where he palette of the artist does not coincide with the idea that manufacturers have of the colors that an artists should have. Some brands, for example, offer boxes of pastels that include pastel hues for certain types of works, such as portraits or landscapes. Some names can be highlighted in the world of pastels. For example, Edgar Degas is considered the first artist who began to use pastels for actual paintings and not just for sketches. Others were successful in the use of pastels as well, such as Monet, Matisse and Renoir. And one of the most expensive works of art ever auctioned is a pastel by Edvard Munch (“The Scream”, 1895), sold for $119.9 million. Paper: UART sanded paper for pastels, with neutral PH and acid free; or Ampersand Pastelbord, a rigid, PH neutral clay and gesso coated hardboard panel with a granular marble dust finish. Backing: For rigidity, the UART sanded paper is mounted on Gatorfoam with PH Neutral Lineco 3M liquid adhesive. Gatorfoam is an extremely rigid, extra light backing that has a polystyrene core. Pastels: Pastels: Sennelier, Schmincke and Unison, among others.